Boston, MA Wall Beds & Murphy Beds | Boston Closet Co.
Functionality meets beauty with Boston Closet Company. Our one-of-kind wall beds are the versatile solution for welcoming the occasional houseguest without sacrificing the everyday uses of your spare room. 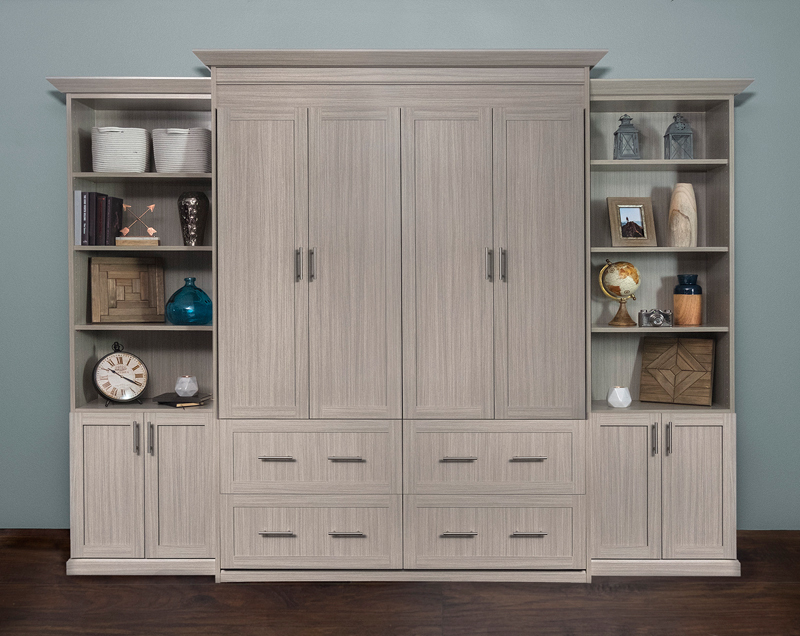 Coupled with beautiful shelving in multiple different finishes, a custom wall bed provides you with all the storage space you need to declutter a room and prepare for guests. Our expertly designed wall beds respect the décor and key purpose of your room, giving it the capability to serve multiple functions. A wall bed allows a room to accommodate overnight guests without sacrificing your craft room or office space. Multiple bed sizes available to accommodate an assortment of needs. Storage cabinets to hide blankets, pillows and sheets when not in use. Seamless integration into any space with custom decorative trim and moldings to give the appearance of built-in furniture. We offer customized wall bed solutions so you can design a comfortable and functional room on your budget. Drawers and shelves used on either side of the bed are completely customizable to your own personal style and individual space. At Boston Closet Co. in Boston, MA, we strive to offer custom-designed organizational storage units for all your wants and needs. Our designers will work one-on-one with you to discuss the perfect wall bed for your home office or craft room. Contact us today or call (617) 628-1150) to get your free, no-obligation consultation so you can get a feel for what your custom wall bed will look like in your space.